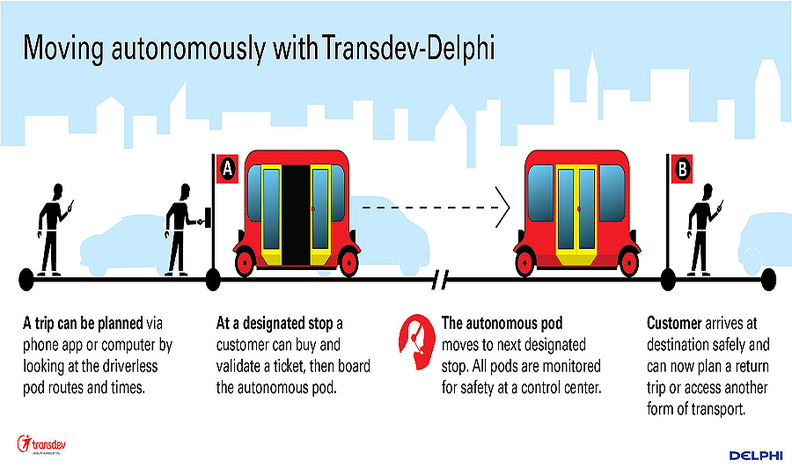 Delphi said its autonomous vehicles will operate in Saclay, a suburb of Paris, along a fixed route from a railway station to the campus of the University of Paris-Saclay. Service will start this year with two cars and one shuttle. Initially, Delphi will post a backup driver in each vehicle, who will monitor performance. Customers will use a smartphone app to hail the vehicle, which will be tracked by a remote command center. In Normandy, Transdev launched an on-demand ride-hailing service earlier this year. According to Delphi, the Normandy service will provide the partners with an opportunity to road-test the entire system, including the dispatch, remote control and sensors used on the vehicles. The car model used in Delphi's new service will be the Renault Zoe. There will also be a shuttle. Initially, the two cars will be used in Normandy and the shuttle will be used in Paris. The Paris service appears similar to a ride-hailing service that Delphi is launching in Singapore this year. In that city, Delphi operates a single Audi SQ5 crossover guided by an array of lidar, cameras and radar. In July, Delphi plans to add two more vehicles to its Singapore fleet, plus an additional pair of vehicles early next year. The Singapore taxis will carry a trained driver to keep an eye on things. Delphi hopes to begin running those vehicles without drivers in 2019. Delphi also plans to introduce a ride-hailing service in the U.S., most likely in Pittsburgh or Boston. Glen De Vos -- Delphi's chief technical officer -- told Automotive News last month that ride-hailing services are the safest way to introduce the first generation of fully autonomous vehicles. Automakers have been struggling to design self-driving vehicles that can safely transfer control back to motorists. "When they re-engage, will they do something stupid?" De Vos asked, referring to untrained motorists in a self-driving car. "Will they overreact? We want to avoid those gray areas."